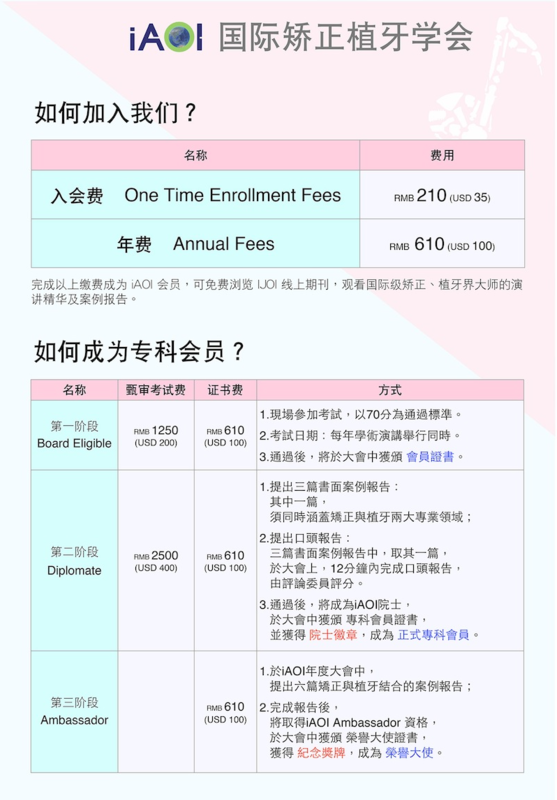 Doctors can go to http://iaoi.pro/ to apply for membership to join iAOI. 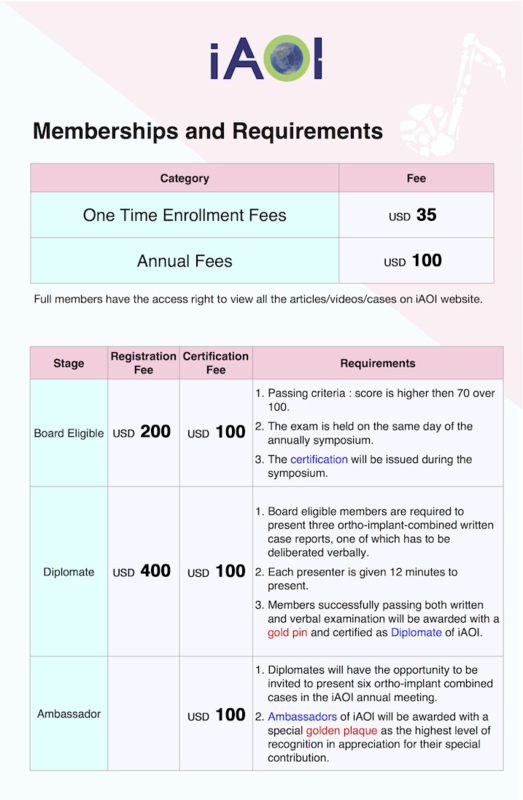 Registered members will have the right to purchase a workbook in preparation for the entry exam. All registered members can take the entry exam. The examinees are expected to answer 100 randomly selected questions out of the 400 ones from the iAOl workbook. Those who score 70 points or above can become board eligible. Board eligible members are required to present three written case reports, one of which has to be deliberated verbally. This is a single case report for each presenter and all presenters as well as evaluators are kindly requested to follow our time management policy. Each presenter is given 12 minutes to present. The first ring will be on in the 10th minute and mic will be shut down in the 12th minute. Followed by each presentation, evaluators will be given 8 minutes in total for comments. All evaluators' mic will be shut down in the 8th minute. This means if the first evaluator has spoken 6 minutes, the second evaluator will only have two minutes to comment. Further comments will be provided in the form of writing. (1) Case report was presented in a well-organized, logical manner. (2) Demonstrated thorough knowledge and understanding of this case. (3) Appropriate audiovisuals were used which aided my understanding. (4) Quality of treatment met the IBOI standards*. (5) Case records are well documented and of high quality. * Please refer to the IBOI DI, IBOI CRE, IBOI P&W for more information on the IBOI case evaluation standards. Members successfully passing both written and verbal examination will then be certified as Diplomate of iAOI. Diplomates will have the opportunity to be invited to present six ortho-implant combined cases in the iAOI annual meeting. Afterwards, they become Ambassador of iAOl and will be awarded with a special golden plaque as the highest level of recognition in appreciation for their special contribution. 회원가입은 http://iaoi.pro/ 에서 가능하며, 등록된 회원은 입회 시험에 대비한 문제집을 구매하실 수 있습니다. 등록된 모든 회원은 입회 시험의 기회를 가지며, iAOI 에서 출제한 400 여개 시험 항목 중 임의로 선택된 100 개에 대해 답을 제출합니다. 70점 이상의 성적을 받은 응시자에겐 board 자격이 주어집니다. 이사진 자격을 가진 회원은 3가지 임상 보고서를 제출해야 하며, 그 중 한가지는 구두보고를 포함합니다. 서면 및 구두 보고를 통과한 회원에게는 iAOI Diplomate 로의 자격이 부여됩니다. 구술시험은 각 발표자가 single case 를 발표하는 형식이며, 시험 시간 관리 규정에 따라서 모든 발표자와 평가자들에게 일정한 시간이 동일하게 주어지게 됩니다. 각 발표자는 12분의 발표 시간을 가지며, 처음 종은 발표 시작 10분 후 울리게 되며, 발표 시작 후 12분 후에는 자동적으로 마이크가 꺼지게 됩니다. 발표자의 12분간의 발표 이후에 평가자는 발표 내용에 따른 의견을 8분간 질의 할 수 있는 시간을 가지게 됩니다. 모든 평가자의 마이크는 8분 후 자동으로 꺼지게 됩니다. 다시 말해, 첫 평가자의 질의가 6분간 진행 된다면, 다음 평가자의 질의는 2분 이상 할 수 없도록 되어 있습니다. 추가적인 의견 및 질의는 서면으로 제공되게 됩니다. 각 발표자의 case report는 아래의 기준을 바탕으로 평가 될 것입니다. * IBOI case 평가 기준은 IBOI DI, IBOI CRE, IBOI P&W 를 참고하시길 바랍니다. 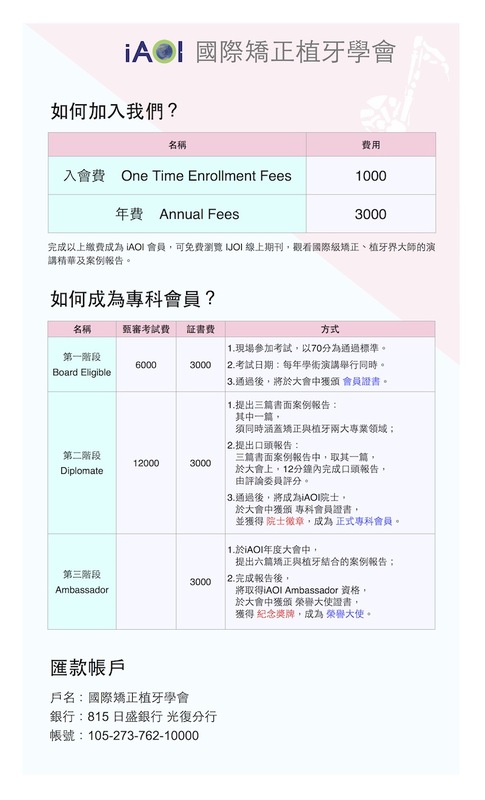 입회 시험 및 구술 시험을 성공적으로 통과한 회원에게는 iAOI Diplomate 자격이 부여 됩니다. Diplomates 는 iAOI 의 연례 회의에서 six ortho-implant combined cases 를 강연할 기회를 갖게 되고, 그들의 특별한 기여에 대한 감사의 보답으로 황금 상패가 주어집니다.